During this familiar folksong, an old lady swallows all sorts of animals. In each instance, she swallows another animal in hopes of catching the previously swallowed animal. 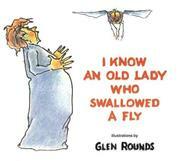 Rounds, Glen, “I know an old lady who swallowed a fly,” Children's Picture Book Database at Miami University, accessed April 19, 2019, https://dlp.lib.miamioh.edu/picturebook/items/show/10447.